It's best that you don't attract its attention. Good thinking! It has been released (although unleashed upon Neopia might be a better description). With a rarity of 100, however, it is seldom seen (which is probably for the best). Could you imagine the mass hysteria that would occur if it did appear? Adoption agencies are still fine, as long as there are no extreme application processes going on. If you have permission from a player to assist in adopting out their Neopet, then it's fine to post about it. 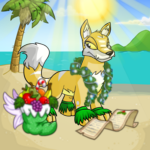 The reason we allow this is that the person seeking the Neopet has nothing much to lose, except for a reasonable amount of time and effort spent explaining why they would be a good owner to the Neopet. Indeed it does. The Art Gallery competition welcomes and encourages art of all kinds. Less than 2% of our submissions are created using traditional mediums, however, making it seem like we prefer digital art. Sorry, our first mental response to this was: o.O? We will now offer the more informative response that no, we do not kick you off the site for having too many Neopoints. There are players that have literally hundreds of millions of Neopoints in the bank and they're still here. :) So, no worries! It seems Sweets holds the trophy for longest-tenured Neostaff member still working with us. She's been a member of the team since day one in California. Give her a hand! You don't want to see her angry. Done AND done. Thank you for being very specific about which stamps had this issue. It helps us a lot when people send specific information rather than vague comments / questions. Yep, it's released. We even tested it ourselves. It's a rare prize that you have a chance to find when opening either a Christmas Gnorbu Stocking or a Christmas Peophin Stocking. Also, it's r101, so it doesn't show up in the results of the Neopets search box. Because everyone knows that, if crickets are chirping, then there aren't any other noises! Therefore if she's sneaking, and crickets can be heard, then there clearly can't be any other sounds that would suggest a Kau is sneaking about. See? It makes perfect sense! Sorry, you'd need to repaint him to get the clothing.